In Europe, there has been a fall in bee colonies since 1965. Unusual weakening and mortality was reported in 1998. France, Switzerland, Germany, the UK, Spain and Italy were worst affected. 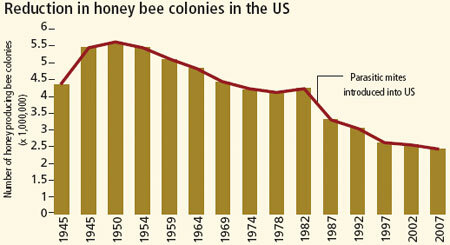 In the US, loss of bee colonies has aggravated since 2004. During 2006-2007, 29 per cent beekeepers in the country reported Colony Collapse Disorder, with a loss of 75 per cent colonies. 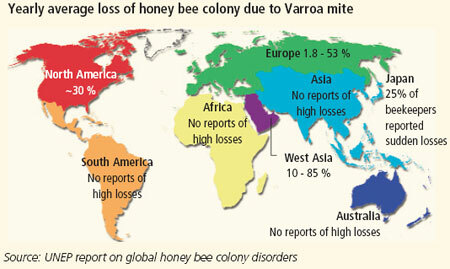 In Asia, China, with six million bee colonies, has faced colony losses in the recent years due to Varroa mite attack. 25 per cent of Japanese beekeepers have suffered the losses. The report says there are “more than a dozen factors” behind bee deaths. These include air pollution, fast-spreading fungal diseases and varieties of parasites such as the Varroa destructor, as well as the loss of habitat of wild flowers in intensively farmed areas. The increased use of pesticides, including broad spectrum and systemic pesticides, which are absorbed by plants affect bees through pollen and nectar. These pesticides combine to form a lethal cocktail that damages bees’ sense of direction. Because of air pollution scents that travelled 800m in the 19th century now travel only 200m, making it harder for bees to find plants, their food source.